In college I had a kind of first "art mentor," a fellow student who was a couple years older than I was. He drew and wrote constantly, listened to punk music, and introduced me to a variety of artists and musicians I am still interested in today. For all of his cultural introductions, I thank him, Richard Herring, still painting in California. One of the artists I learned about from Richard was Robert Rauschenberg. Rauschenberg's work fascinates me. It is bursting with color, texture, and experimentation, technical skill, interesting composition, and curiosity. A friend asked, What about content? and for a moment I was stunned. What about content? 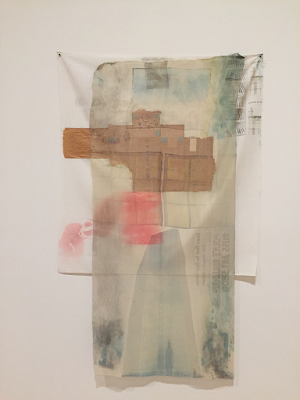 But then you look to his questioning the hierarchies of materials and his transfer drawings from the current newspapers, and you find political commentary, particularly of the 1960s. You look at the various projects he set up and you see was devoted to social change through art, whether it was exchanging artwork for health care for other artists in need or working with artists and organizations around the world to encourage conversations and peace. If you are not familiar with him, in his own art Rauschenberg is the one who did the assemblage "Combines," the all-white paintings, the black textured paintings, the printed tire track, asked Willem de Kooning for a drawing he could and did erase (he particularly wanted one that could be considered valuable), set designs for Merce Cunningham and Trisha Brown, among many other things. For his time, Rauschenberg pushed and pulled at his materials, tested, and reorganized, mixed genres, including dance and voice, and seemed to have a most joyous time of it! 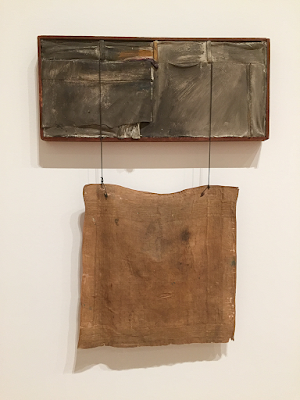 Before I went, I was surprised to read a review in the NY Review of Books, "The Confidence Man of American Art" by Jed Perl, an art critic I have in the past admired, in which the tone seems to disparage Rauschenberg as a "trickster, showman, and charmer" and sees his work as "megalomaniacal output" luckily with "embarrassments" left out of the show. But Jed Perl also believes in an old style of artist in which the artist searches for "perfection" even as he is looking outside his main medium, in order to revitalize "a particular discipline." With this in mind, I wondered if something in me had changed. If I would see, too, what Perl sees. Or feel it. I did not. Perhaps because I believe that an artist has the freedom to change media whenever she sees it will enhance her own growth, expression, or message. 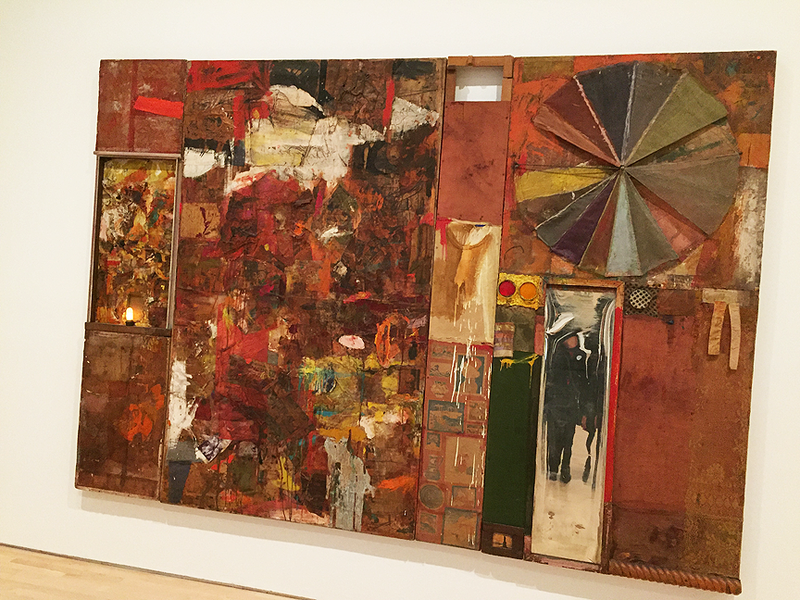 Rauschenberg's work has an energy, perhaps a spontaneous one, that is different from the technical virtuosity of highly detailed work. His is a virtuosity with combinations and materials. Sometimes the beauty is in what is there and how the parts are in conversation with each other, sometimes in what is left out, sometimes in how it is cropped or framed. You can see Black Mountain College and Josef Albers' teaching in the opposites that appear, such as: light/dark; soft/hard; messy/clean edges. The catalogue for the show, Robert Rauschenberg is a wonderful keepsake, but if you can see the show in person, I recommend it. I took a few photos while I was there. And a large painting with a funhouse mirror embedded in it. 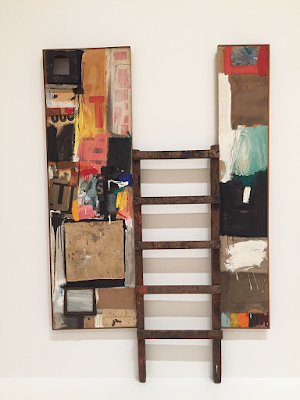 The current Rauschenberg exhibition, "Erasing the Rules" at SFMoMA was that "call to action" I wrote about in January. 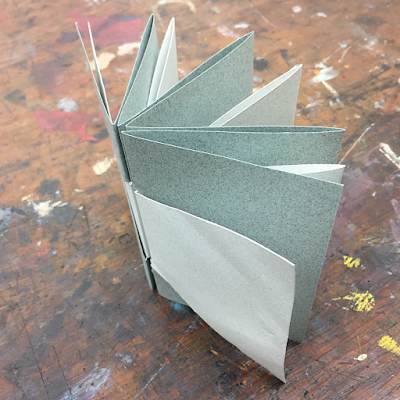 My body was buzzing, and I couldn't wait to get back to the studio and make something. 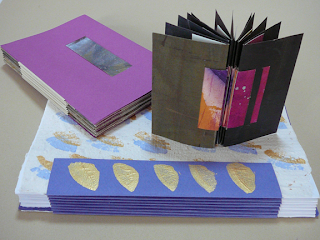 Much imagery at the Rauschenberg Foundation website here, including a book. Wonderful SFMoMA Essays about Rauschenberg's work here. Essay about the white paintings here. Essay about erased drawing here. Essay about automobile tire print here. This is so cool; I especially like his Hiccups, 1978. At the SA MO MA site, you can see all the pieces. Love his idea of zippers and re-arranging at each exhibit. Hi Gina, Yes! Hiccups is so neat! 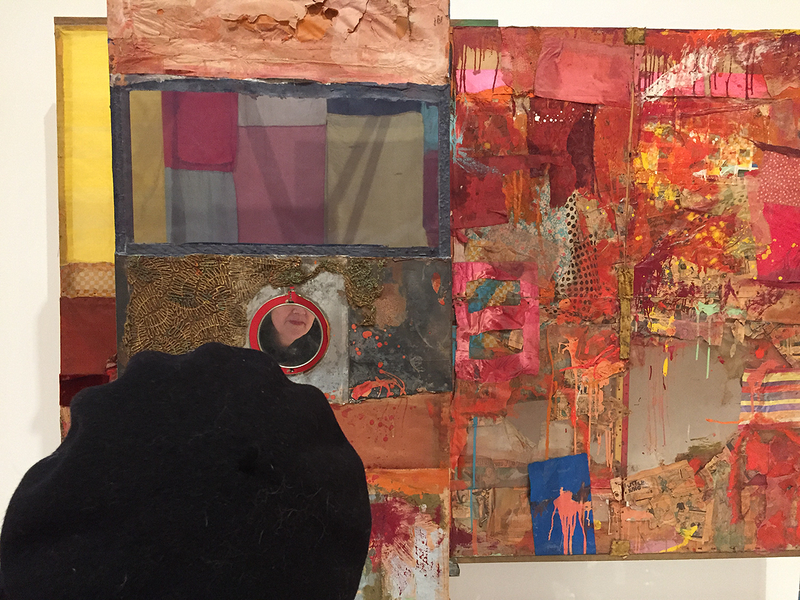 I wonder if Doug Beube (who used zippers in his bookwork Zipper Theory: Facing Shame Tomorrow 2005/2010 as well as in others, Pocket Book from 1992, and The Many Lives of Miss Chatelaine, 2008) was influenced by Rauschenberg. I am beginning to wonder if there is anyone who hasn't been influenced by RR, consciously or not. Rauschenburg is a SouthEast Texas native and there is a nice collection of his posters in the Museum of the Gulf Coast. He did posters for several organizations announcing their annual convention. The exhibit is not always open for viewing; I have had the pleasure of seeing it several times--always interesting to see how he uses typography in his work until he had claims against the income generated from his work. Bea and Syvlai, thanks for writing. Interesting about the typography and his response. We are always conflicted, I think, when we feel differently about the artist and the work. That issue is very much in the news these days.